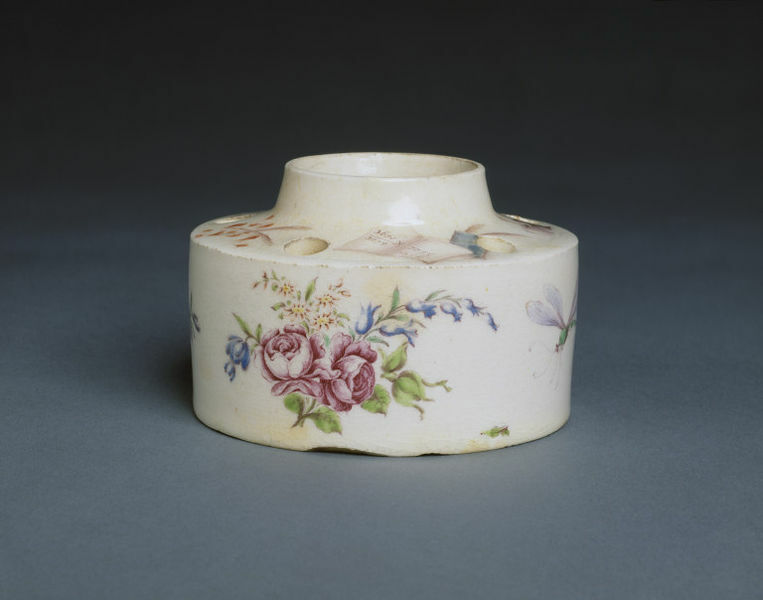 Inkwell of soft-paste porcelain, with glass liner. A low cylinder, with a central circular well surrounded by five holes on the shoulder. The sides decorated with bouquets, scattered flowers and a dragonfly; the shoulder decorated with quills, dividers, rulers, a mathematical manuscript and a geometrical equation. This documentary inkwell is the only signed piece of porcelain by James Welsh, a painter who is known to have been working at the Chelsea factory in October 1750, and at Bow from at least 1754. Christies sale catalogue, London, 9th October 1898, lot 134. 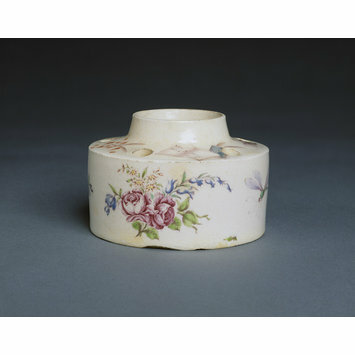 Adams, E. & D. Redstone, Bow Porcelain, London: Faber, 1991, pp. 69-70. Stevenson, Tony "James Welsh: A Bow Porcelain Painter Revealed" in Apollo, January 1993, pp. 12-17.